Whew, 2018 here we go! I was not ready for this year to start you guys, I really wasn’t. But here we are, making moves in the New Year! I asked you all on Instagram what post you wanted to see first, and my 2018 goals and plans for the year was a big “YES”. So, here we go with my new year goals and how I plan on starting them. 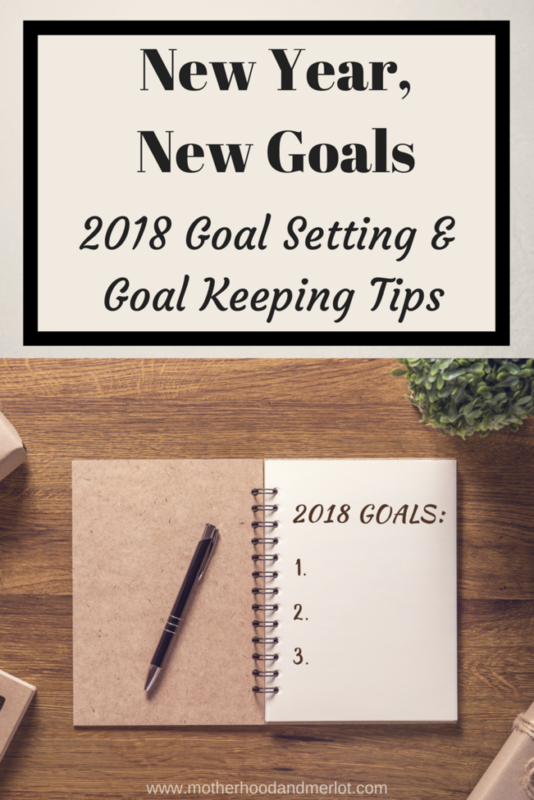 For my goals, I want to achieve personal goals, family goals, business goals, as well as doing three things that completely scare/intimidate me. Buy a house. This is a family goal that I have for this year. We have been renting for ever it seems like, and have been back and forth on where we want to live. While we still don’t know exactly what our living situation looks like over the next few years, buying a house, at least to keep for a little while and use as a rental property, is a huge goal of ours. Expand this blog community. I would like for Motherhood and Merlot to double in size, all around, this next year. With the support of all of you, I know we can get there! It has grown so much, and I have met so many amazing people through this community, and I want to continue to do that and be as empowering and as helpful as possible in 2018 to those that follow this blog and my social channels. Attend one blogging/personal development conference. I have been wanting to do something like this for a long time, and this is the year that I plan on making it happen! These are huge for bloggers and influencers, not only to help make connections but to learn so much about how to be successful and helpful to our readers in this industry. Earn business degree certification. As some of you know, I was finishing up my Master’s degree before my brother passed away. For the time being, I don’t feel like I can adequately counsel other people. So, I want to help my husband grow our online marketing company, and take some business certification courses to learn more about operating a company. Travel overseas. This is my second intimidating thing, mostly because of my irrational fears about planes and being stuck in another country… I know, it seems silly. But I do LOVE to travel and see the world, especially historical places. Add at least $500 to our savings each month. Again, this is another family goal that we have. I am still trying to come up with a money saving plan to do this. Once I do, let me know if you all would like for me to share it! Participate in a figure competition. This is my last scary thing, but I seriously LOVE working out and the way that it makes me feel. Again, if you want to follow along with this, let me know:) I would be happy to share on this journey. Let go of anything that is not serving me. I want to take the time this year to figure out the things that drain me, the things I am passionate about, and what I look forward to. Then, using that, figuring out a way to invest more time and energy into the positive things, and get rid of everything else. Too much time is spent on things that do not give back to us or serve us in any way, and it is a waste considering how many other important things I could spend that time on, like time with my loved ones and children, and time going after passions and dreams. Wow, these are some BIG goals! Best wishes for the New Year! Such inspiring goals! Get it girl! I have some goals that I need to write down and make a vision board. Love these goals so much! #8 is so unique! Good luck on all your goals! Those are some big goals! They seem especially huge compared to my little teeny ones. I’d love to hear more about your book, I have so many ideas and haven’t started on any of them. These are some great goals. Buying a house is stressful but so worth it! I like the goal of letting go of what is not serving you. I am trying to do this more.